Nothing could be worse than having a plumbing or heating contractor show up at your home or office and not have the parts needed to perform the service you need. At Norwalk – La Mirada, we take great pride in insuring our technicians have the supplies they need in their vans. Our well-stocked vans carry all of the proper tools and parts to help handle minor and major repairs as well as preventative maintenance. Do not take chances by hiring a contractor who may show up without the parts and tools necessary to solve your problems. 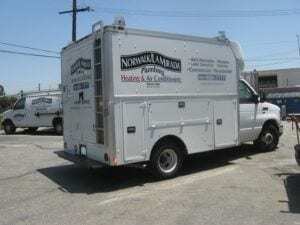 At Norwalk – La Mirada we have all of the required equipment, parts, and talent to solve your heating, plumbing and air conditioning problems. Regardless of what area of Southern California you live or work in including Norwalk, La Mirada, Whittier, Santa Fe Springs, La Habra, Downey and Cerritos, we are fully prepared with the tools and parts needed to make your all repairs needed.